A TRADE delegation to the US has already yielded results for the North West with the establishment of a Boston office for cross border company GoWalkTalk. GoWalkTalk is a Derry-based healthcare management solutions company with a joint partnership with Donegal's Gartan Technologies and US firm Adashi Systems. The Ireland North West delegation, the first of its kind to travel to Massachusetts, was a cross border, cross agency visit involving Derry City and Strabane District Council; Donegal County Council; Udaras na Gaeltachta, Ulster University; Letterkenny Institute of Technology and the North West Regional College as well as 17 local businesses including O'Neill's sportswear and Hanna Hats. 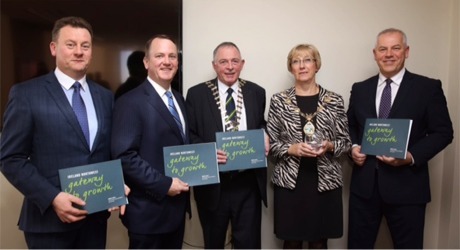 Members of the Ireland North West delegation launch the Gateway to Growth programme in Worcester, Massachusetts, last week. Included from left, are Seamus Neely, Donegal County Council chief executive; Tim Murray, CEO Worcester Regional Chamber of Commerce; Mayor of Donegal Cllr Thomas Slowey; Mayor of Derry City and Strabane District Council, Alderman Hilary McClintock and John Kelpie, CEO of Derry City and Strabane District Council. Donegal County Council ceo Seamus Neely said potential US investors were "very interested to hear that Ireland North West is ranked in the top 10 economies in the world for ease of doing business and starting a business". He said they also heard about the region's strong and diverse SME base, entrepreneurship and cost-competitiveness. "We went out there with a very clear message that our unique location is our strength and how we provide the only region that has a land border between the UK and the rest of the EU," he said. “Our young, well educated population with their strong worth ethic, and the fact that 31% of our school leavers are educated to degree level and have right skills for employment, were very much of interest to the businesses we spoke to," he added. Derry Mayor Hilary McClintock said the visit was "very significant" said the visit gave the delegation "a real insight into the US market and the opportunities that exist for development and expansion". Meanwhile, Orla Ward of O’Neill’s, Ireland’s largest sportswear manufacturing company, said a number of "very positive" leads were created with Boston colleges and universities interested in quality performance playing kits.